Kindred Being has compiled this collection of crystal descriptions, their attributes, and energetic properties. Please enjoy this collection and stay tuned as we expand this collection further. Amethyst is a purple semi-precious gem prized the world over for it's beauty and energy healing properties. Associated with the crown, third eye and etheric chakras, it aids in activating and bringing balance to these areas. It's literal translation is "not intoxicated" thus it is used for sobriety in thinking and in habit. It can be used to quiet the mind and enhance meditative states. Amethyst is a high frequency cleansing crystal that allows one to stay centered while accepting spiritual direction. We have found that the use of amethyst on the third eye and crown chakras can accelerate intuitive and psychic abilities and communications. *Kindred Being offers suggestions for energy and chakra work. Our advice is not to be substituted for immediate or regular medical attention. Ammonites are marine mollusks who lived in the seas between 400 - 65 million years ago from the Devonian to the Cretaceous period and became extinct along with the dinosaurs. Similar to modern day Nautilus, they are thought to have created a new chamber every 4 weeks. 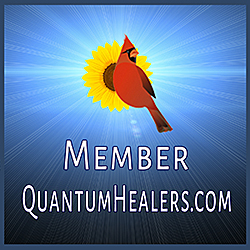 This constant growth symbolizes continued spiritual growth and transformation. Ammonites are known for awakening Kundalini energy, assisting in past life recall, and contacting Spirit Guides. Ammonites have absorbed energy for hundreds of millions of years. This fossil can offer relaxation and stability for use in Feng Shui. It can bring a sense of grounding and protection to any space. Ammolite is an opal like gemstone made up of fossilized shells of the Ammonite mollusk. Ammolite is found primarily in the Rocky Mountains of North America. It is one of three biogenic gemstones. The iridescence in Ammolite is due to the thin layers of platelets that make up the structure. Red and green colors are produced with thicker layers. Blues and violets are produced with thinner layers. Ammolite itself is a very thin sheet rarely found without it's matrix. Ammolite assists in activating all of your latent physical and etheric DNA strands. It brings about evolutionary shifts in consciousness. It also allows you to be awakened to the energetic shifts on Gaia as well as becoming a leader in assisting the awakening of others. Ammolite has absorbed the knowledge of the universe over time. Thus, it enhances wisdom, increases wealth and improves the flow of energy in the body. In the home, it increases harmony and vitality in all that enter the space. 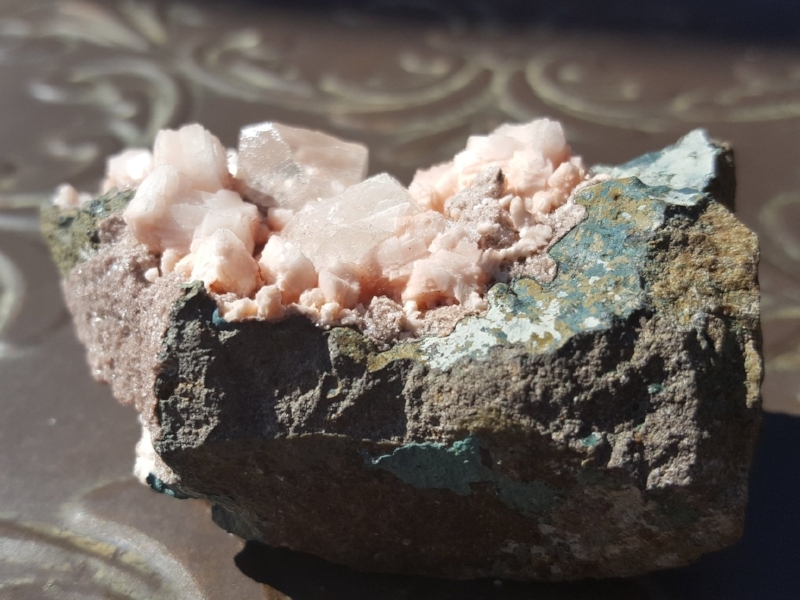 Apophyllite forms in cubes, pyramidal shapes, single crystals and clusters. It can be clear, white, green, yellow or peach. Apophyllite is a very special crystal. Because of this crystals high water content, it is a great energy conductor. Apophyllite is a strong vibrational transmitter. It creates a bridge between the corporeal and non-corporeal planes. It is a carrier of the Akashic records which are said to be a record of all that has happened and will happen. This stone enhances ones natural intuition, clear sight, and future sight. This is a perfect stone for use in scrying. This is a crystal of truth allowing ones true self to show through. It allows the mind to be attuned to spirit. It can facilitate out of body experiences as well as spiritual visions. Black Tourmaline is highly protective. 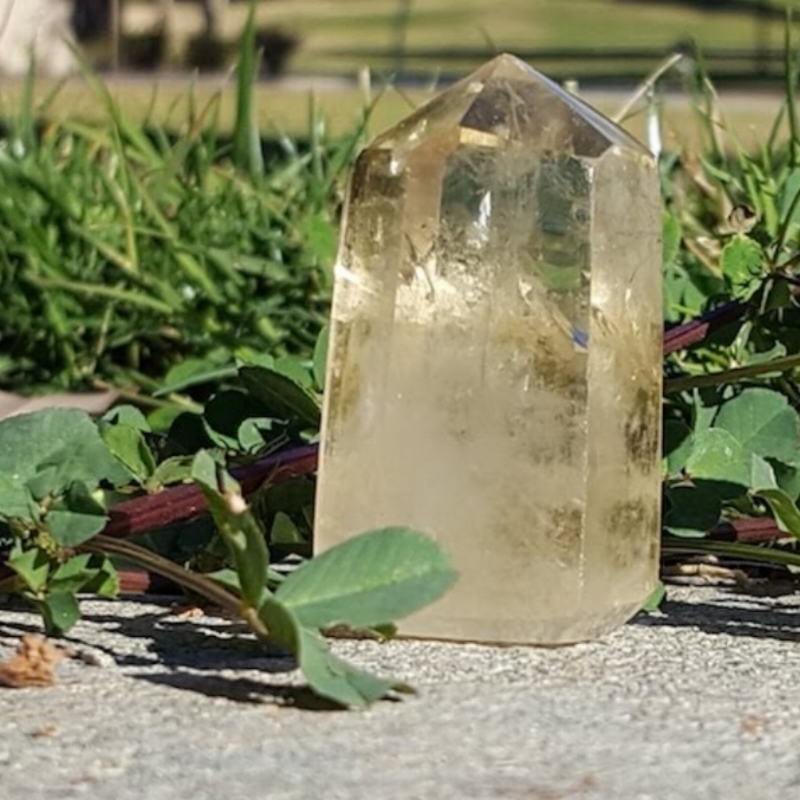 This crystal will protect you from harmful electromagnetic smog, spells, ill-wishing, psychic attacks, negative entities, and negative energies of all kinds. Use this crystal to clear negative thoughts in your home through crystal gridding. Point black tourmaline away from you to clear your own negativity. Place this crystal between you and the source of electromagnetic smog for dispersion. 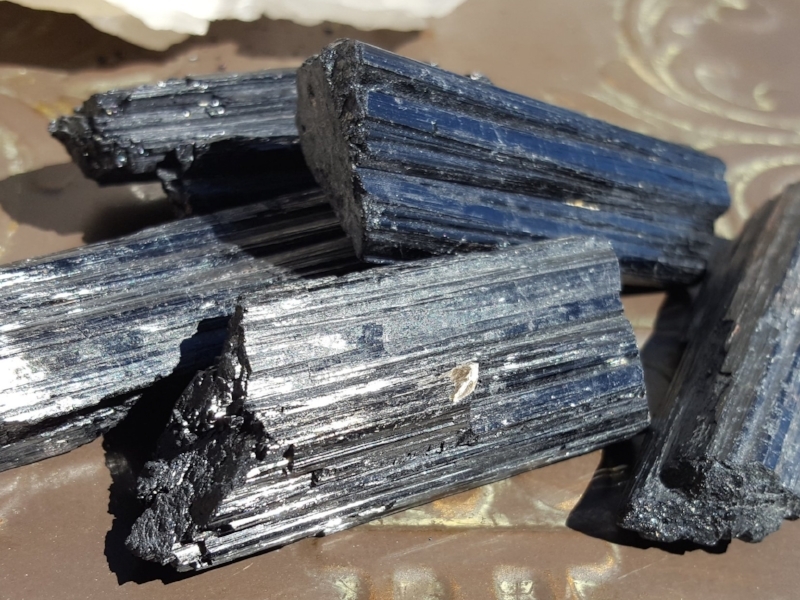 Black tourmaline has grounding attributes associated with the base or root chakra. It balances your moods and thinking promoting an objective and reasonable viewpoint in your everyday life as well as during times of adversity. It transmutes dense energies into lighter and higher vibrations. Carnelian forms in the colors red, orange, pink and brown. Carnelian is a grounding stone and is associated with the root or base chakra. It can anchor you into the present reality and imparts an acceptance of the cycle of life. It removes the fear of death. Carnelian cuts through negative programming and gets you to solutions. It enhances clarity in thinking. Carnelian can help with metabolism and fertility problems. It protects you from giving into emotions of envy, rage, and resentment. Use carnelian with your other stones as a cleanser. Carnelian is one of few stones that do not need clearing and can actually clear your other stones and crystals. Celestite, also known as Celestine, has been largely used to contact angels or higher beings. Use Celestite to release unwanted negative feelings. This blue, yellow, red or white Crystal leads you toward awakening and enlightenment. It is a aura healing and truth revealing stone that stimulates clairvoyance and astral travel. Celestite has the ability to calm overwhelming emotions and soothe in all situations. Use Celestite on your third eye to open communications with universal energies. Chalcedony is a microcrystalline form of Quartz. It comes in many differing colors as well as multi-colors. It can often form pseudomorphs after organic material meaning it fills in the space and preserves the shape of decaying materials. Meditate with Chalcedony to hear the voice of your higher-self. This crystal brings balance and harmony to the individual and group alike. It fosters fellowship and a sense of community. It is associated with the throat Chakra and thus aids in communication, understanding, and telepathy. It is a peacemaker in the home. Citrine is prized the world over as a semi-precious stone. Citrine is known for its abilities to attract wealth and fortune and can be used in a cash box or wallet. Citrine is energizing. It is suggested for use with those who have low energy or are in need of an energy boost. Citrine can cleanse a room of negativity and does not hold the energy but transmutes it into the positive. Due to this ability, it is one of few crystals on earth that never need to be cleansed. Clear Crystal Quartz is found in many forms. The six sided prisms of light are used as energy conductors for healing and spiritual communications. They are associated with the crown chakra and are amplifiers of intention. This means that once an intention is set on this crystal, the intention is held, amplified, and transmitted throughout the universe. Clear Quartz are conduits of thought and higher learning. Their beauty comes in many forms. They can be grainy, dense and fibrous formations, compact masses, clusters, and druses. Each size and shape holds immense power of transformation and healing. Use to enhance properties in other stones, to Aid in meditations, for spiritual awakening, and higher communications. Green Adventurine is considered a growth crystal of opportunity. It can be used for progression in life, luck, and success on the physical plane. Green Adventurine creates channels of opportunity for you in this incarnation. Used for benefit of the heart chakra, it balances, and protects the heart as well as emotions associated with the heart. This is a stone of change and renewal. It's harmonizing and balancing energy enables us to both enjoy our current state while not being too involved in situational outcomes. Green Adventurine helps you to accept and welcome change as it comes. Labradorite is a member of the feldspar family. It is comprised of aggregate layers that refract light iridescently. Labradorite is a powerfully protective stone. It is associated with the Third Eye Chakra. It strengthens auras and amplifies your own energies. This stone enables communications and travels with higher beings and realms. It increases psychic abilities and sight into the past and future. This energetically powerful stone aids your everyday life by tempering ones negative and energy sapping sides. It enhances our best traits and allows us to treat the world around us with respect. It is used to dissuade any negative influences. Lapis Lazuli is a stone of serenity. It is a harmonizer of one's physical, emotional, mental, and spiritual aspects. Through this balance, it brings knowledge of self. Lapis Lazuli is a deep blue opaque stone associated with the third eye and throat chakras. This stone "teaches the power of the spoken word". It enables users to activate and balance their throat chakra which encourages one to speak their truth. It helps the user to express feelings and emotions while allowing objectivity and clarity of thought in the face of emotional blockages. Use this stone on your third eye and throat chakras to experience its benefits. Jasper is formed in the colors red, brown, yellow, green, blue, and purple. Jasper is known as the "supreme nurturer". It can unify all aspects of one's life creating wholeness. It can be used to align the chakras, absorb negative energy, and cleanse the aura. It allows shamanic journeys and assists with dream recall. Red Jasper is used for the base or root chakra. It can even out strong emotions making it a terrific worry stone. It strengthens one's boundaries bringing problems to light so that they may be addressed and then provides insight. This stone can be used for detoxifying the circulatory system, the blood, and the liver. Shiva Lingam has been considered a sacred stone for thousands of years. These stones are collected on one sacred day every year from the Narmada river, a holy river in Madhya Pradesh, India. These stones are shaped into elongated ovals and can be red, beige, and gray in color. These stones are sacred to both Hindus and Buddhists alike. The Shiva Lingam symbolizes both the masculine and feminine energies. It is useful in activating both the root and sacral Chakras. This stone also raises and controls kundalini energy. It can assist is facilitating spiritual growth through Tantra. An excellent stone for sexual healing, it gives assistance to heal past sexual abuses. The Shiva Lingam can also help to sever sexual ties from past relationships. This stone imparts psychological insight and encourages the release of outgrown concepts. It stimulates the electrical flow in the bodies systems and subtle meridians. Smoky Quartz is a naturally grounding stone used in association with the root chakra. It is ideal for absorbing and drawing negative energies downward through the body and releasing them to be neutralized within the earth. Smoky Quartz form as druses, massive forms or as crystals. Use Smoky Quartz as a cleansing stone. Hold this stone to relieve anxiety and stress for a soothing and calming effect. Stilbite forms in small crystalline plates, pyramids, or clusters. It can be found in the colors white, yellow, pink, orange, red, and brown. Stilbite carries a loving vibration. It creates action out of thought and grounds spiritual energy. During astral travel, Stilbite keeps you anchored to your physical body transmitting the experience in order to retain information gained from your journey. Use this crystal as a tool for scrying. Place on your third eye to facilitate astral travel and to enhance your intuition. Tigers Eye combines earth energy with sun energy to create a high vibrational state that is also grounded. It can enhance the abilities inherent with ones Third eye as well as balance the lower chakras. Tigers eye can anchor change into the physical body when placed on the navel for short periods. It can facilitate manifestation. Use tigers eye to focus and to assist in transformation towards decision making and commitment. Traditionally, Tigers eye was used as a talisman against curses and ill wishing. It has the ability to make clear the proper use of power. Tigers Eye balances both yin and yang energies lifting lower density moods. Tigers eye is said to stimulate the rise of Kundalini energy. Selenite can be pure white, orange, blue, brown, or green. Selenite has a very fine vibration. It is associated with the Crown and higher Crown chakras. It is a calming crystal that is great for meditation and spiritual work. Selenite is a powerful stabilizer for erratic emotions. It is said that selenite carries the imprint of all that has happened in the world. In this way, it can be useful for checking on the progress of your life path. It can bring clarity to the current lessons that are being worked on and teach how best to progress through them. There are many names for the Desert rose. Other names are Selenite Rose, Rose rock, Gypsum Rose, Gypsum Rosette, and Sand Rose. Desert rose is a form of Selenite gypsum and barite. The two combine through a process of moisture condensation. The masses that result are found in arid desert regions. Desert Rose Selenite is said to release imposed programs that no longer serve you. It then assists in finding a useful replacement. These roses can strengthen affirmations of purpose. It gives you clarity and can deepen your state of meditation. This stone will amplify your intuitions. It is an activator for your third eye. It will raise your vibration so that you can work with your Higher Self and your Spirit Guides. Jade has been prized in the east for many generations. It is associated with the heart chakra promoting love and tenderness while also protecting the user from harm. Jade is used for healing the body throughout the elimination organs and kidneys. Yellow Jade is softly energizing and stimulating bringing understanding of our Kindred connections and building towards inner joy and happiness. It awakens the hidden knowledge of our spirit selves in human form. Zeolite is the name of various crystals clustered together on the same matrix. The combinations are very visually pleasing. The Crystals clustered together may be Apophyllite, Okenite, Pektolite, and Stillbite. Zeolite is often used for Reiki aiding in attunement to Reiki energies and enhancing the response to healing. Zeolite is a wonderful addition to your home due to it's beauty as well as it's ability to absorb toxins and odors. Plant Zeolite in your garden to aid in growth. Zeolite acts as a soil amendment and conditioner.